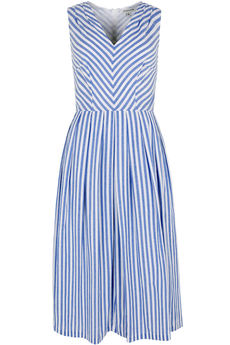 Josie Sun Lounger Stripe Midi Dress is an effortless style for sunny days. The V-neckline and soft pleats at the shoulders and waist add a feminine touch to this stylish summer staple. Cut from lightweight cotton that feels luxuriously soft and adorned with woven chambray and white stripes. Is finished with side pockets, concealed back zip fastening and is fully lined. Is approx. 115cm in length. New Summer 2019 Collection. Composition: 100% Cotton. Lining: 100% Cotton.